Buy Nutrifolica Shampoo in Malaysia. You will get: one bottle (8oz.) of Nutrifolica Hair Regrowth Shampoo. 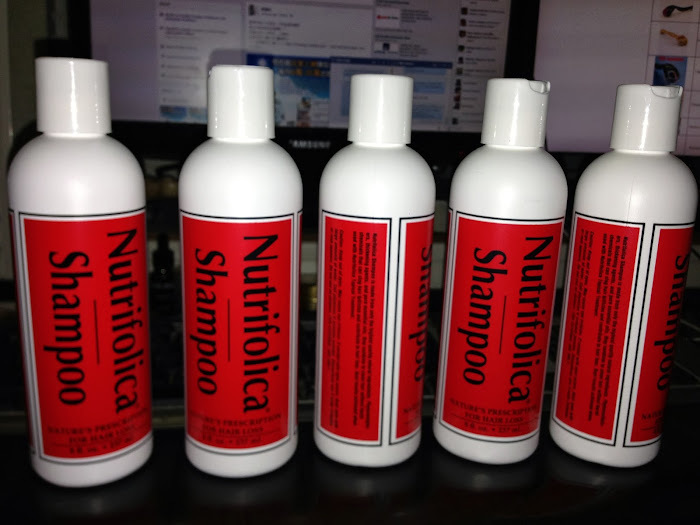 One Bottle of Nutrifolica Shampoo lasts 4 to 8 weeks depending on usage. NUTRIFOLICA SHAMPOO was invented 16 years ago by Allen Parkinson (the famed chemist who also invented SLEEP-EZE, the first sleeping pill - see above photos). This all-natural shampoo increases hair regrowth by nourishing hair follicles with multiple regrowth ingredients like Saw Palmetto, Nettles, Jojoba, and Pyrifora. Unlike drugstore shampoos that contain sulfates (a common chemical in floor cleaners), Nutrifolica Shampoo is designed to protect your scalp as it deep cleans with yucca extract and sea kelp, leaving no residue behind. Unfortunately, standard store bought shampoos can clog follicles with gelatin based thickeners. Nutrifolica Shampoo utilizes phyto-revitalizers and essential oils to dramatically increase hair retention and manageability for all types of hair (especially for people who have dyed hair). Clogged follicles make it difficult for any hair growth treatment to reach its target: your hair follicle. Nutrifolica Shampoo will help you keep what you have left, and help you regrow what was lost (starting where hair loss most recently occurred). The majority of people suffering from hair loss have elevated levels of DHT - the bad body chemical that is a bi-product of testosterone. DHT constricts the hair follicle, restricting blood flow to the cells that grow hair. The bad news is that once DHT causes irreparable damage to the hair follicle, it dies. The good news is that it takes 5 to 6 years after a hair has fallen out due to DHT for the follicle to permanently die. Nutrifolica Shampoo's ingredients help jump-start regrowth and revitalize dormant hair follicles that have been damaged by DHT. The important factor is to start treatment sooner rather than later because once shinny scar tissue has formed over the cells of the hair follicle, nothing can be done to regrow hair in that area. Start using Nutrifolica Shampoo in the beginning to intermediate stages of hair thinning to stop baldness before it's too late. Don't wait until you are shiny bald to start. For fastest results, use with NUTRIFOLICA TREATMENT. The Hair Care Store is now 20,000+ customers strong. And with our almost 100% positive customer feedback rating, you may bid with confidence! Nutrifolica Shampoo. All Items are new set, and original imported from United State.